20-inch thighs; whereas the tumbler had 14-inch arms and 22 -inch thighs. When they came together, the tumbler took hold of the gymnast and ran him backwards across the gym; and then up-ended him and stood him on his head. The tumbler's constant springing, leaping, bending, and twisting had given him great strength in the thighs and waist; and that is the kind of strength which enables a man to push forward against greater resistance, and to keep his feet against the onslaught of a powerful opponent. It may surprise you to know that only a strong-backed man can lift great weights to arms' length above the head. 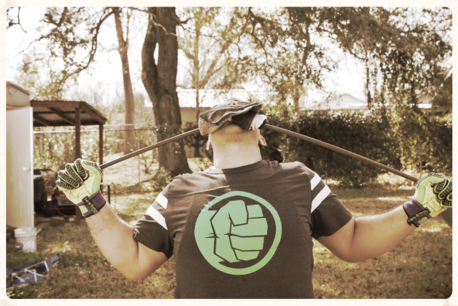 One of the simplest training stunts of the lifters is to take a bar-bell in both hands and push it several times in succession to arms' length above the head. A man who is accustomed to using bar-bells will do this quickly and easily; and when he pushed the bell aloft his body will remain erect. Anyone who had never used weights, on seeing a lifter raise the bar-bell in this easy fashion, would be apt to exclaim, "My! that chap must have strong arms to be able to push up a heavy weight in that way." If the lifter invited the bystander to try to push the bell aloft, here is what would probably happen: In the first place, the novice would have considerable difficulty in raising the 100-lb. bell from the floor to the chest, on account of the lack of strength in his back; and if he did get it to the shoulder he might press it to arms' length; but, as he did so, his body would be bent over backwards at the waist-line, he would have to make a tremendous effort, would get red in the face and, after he had lowered the bell to the ground, would probably complain that he had wrenched the small of his back. The above is not a supposititious case. It is a thing that I have seen happen dozens of times, even when the novice at weight-lifting was a man who had spent months, or even years, at light exercises. I have seen gymnasts with fine upper arms (which they had developed through chinning the bar and dipping on the horizontal bars) fail to press aloft a weight so light that it would be a joke to the average lifter. In such cases, the gymnast is usually quite puzzled. He knows that his arms are as big as are the lifter's arms, and he thinks that he has failed because he has not the "knack" of lifting; whereas, the reason for his failure is merely lack of back strength. Here is one thing that you, who read this book, must get firmly fixed in your mind; and that is, when a man is standing on his feet he positively cannot exert the full strength of his arms unless the strength of his back and legs is in proportion to the strength of his arms. I do not mean that the back must be just as strong as the arms, but that is must be many times stronger. I understand that in these college "strength tests," when they wish to get a record of a student's back-strength, they put a leather collar around his neck, have him stand with legs straight, lean forward from the hips, and then attempt to bring his body to the upright position. The collar referred to is a loop of strap attached to a chain; which, in turn, is attached to some spring registering device. After this test is completed the student is told to stand with his body upright, his legs slightly bent, and then to endeavor to straighten the legs so as to get a register of his leg-strength. pair of hinges with leaves of different thickness. Even if the leaf which fastened to the door were a quarter of an inch thick, you would know that the hinge would be no good if the leaf which fastened to the door-frame was made of tin and only one-sixteenth of an inch thick. When you lean over in the manner described and pull against a registering machine, or pick up a heavy weight, your back corresponds to that part of the hinge which is fastened to the door, and your legs to that part which is fastened to the door-frame. Therefore, unless his legs are powerfully developed, no man can show a high record in a test of back-strength. In fact, as we go along, you will become more and more impressed with this interdependence of the muscles. 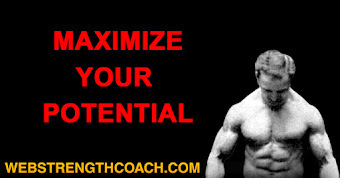 You will find that in any feat of super-strength the athlete who accomplishes it uses as many muscles as possible. 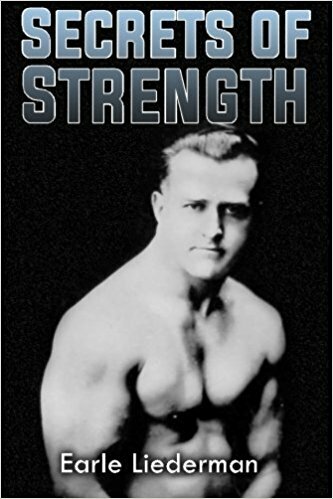 The reason that so many strength records were made, and are held, by men who have practiced with weights, is because when a man uses weights he is practically compelled to use his muscles in interlocking groups. In this chapter, when I refer to the back, I particularly mean the muscles in the back which control the action of the spine. On either side of the spine there are long muscles which run all the way from the base of the skull to the hips; and these muscles are called the "erector-spinae"; that is, the muscles which straighten or erect the spine. In the lower half of the back, these muscles are plainly visible, and when fully developed they appear like two ships'-cables. 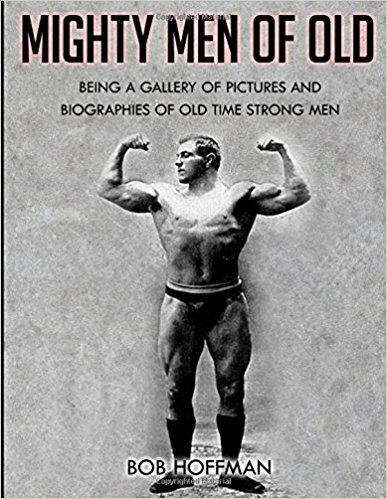 If you wish to gauge the strength of a man's back don't look at his shoulders, but at the small of his back - his loins, his haunches and the back of his thighs. sufficient to develop the back muscles to their full extent. Now this is very far from being true. The lower back muscles are prodigiously powerful when fully developed; and it takes more than raising the weight of your own body to bring out that full development. The simplest of all exercises for developing the muscles which control the spine, is the one in which you stand with the legs stiff and straight, and then bend the body over by arching the spine, and touch the floor with the tips of your fingers. When you bend over, all you do is to stretch the muscles along the spine and the back of the legs. It is contraction, and not stretching, which develops muscles; so that these muscles do their real work as your body is raised again to the upright position. Yet nine men out of ten think that the important part of the exercise is the bending over. (In fact, most people use this exercise to reduce the size of the abdomen.) In order to get any noticeable development of the back, it would be necessary to repeat that exercise several hundred times in succession; whereas, if you put a further tax on the back muscles, by holding a moderate amount of weight in your hands, you can, by making a couple of dozen repetitions, develop back muscles of much larger size and very much higher quality. In some systems of exercise, instead of merely bending over and touching the floor with the finger tips, you are told to stand stiff-legged, with the feet spread apart, and then to take a light dumbbell in each hand, bend forward, swing the bells backwards between the legs, and then swing them to arms'-length overhead. This is a better exercise than touching the floor, because the light bells are swung backwards at arms'-length; and this movement, on account of the increase in the leverage, gives fairly vigorous exercise to the back muscles, even when a pair of light bells is used. But that is just another spine exercise. If you wish to get super-strength it is absolutely necessary for you to teach your back to work in concert with the legs. 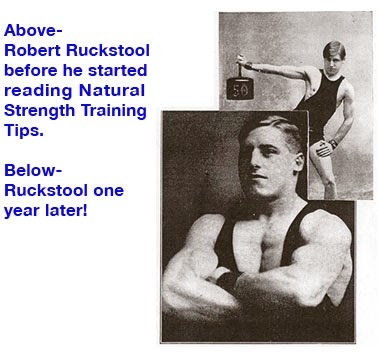 Later on, in the chapter about dead-weight lifting, I will show you how many so-called "back-lifts" are really "back-and-leg" lifts, in which the legs do most of the work. 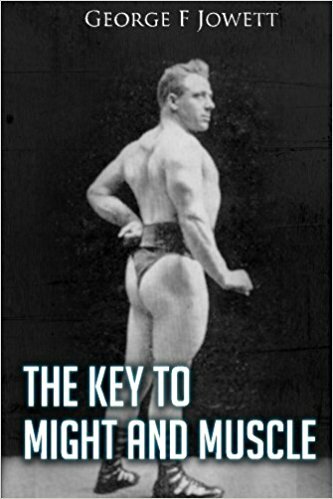 Every great "Strong Man," whether amateur or professional, has had to master the secret of the "flat back," which is one of the most vital requisites of super-strength. 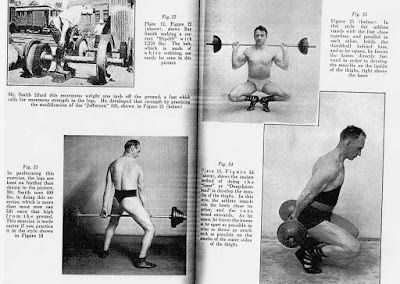 The description of the positions in which a "Strong Man" uses the "flat back" belongs just as much in the chapter about the legs as it belongs here, but we may as well have it now. The main point to be remembered is that any individual, athlete or otherwise, can deliver several times as much power when his back is flat and his spine straight, as he can when his spine is arched. This applies in practically any feat of weight-lifting, or actual labor, where it is necessary to move, shift, lift, or carry an article weighing several hundred pounds. When a truckman or porter wants to move or up-end a square case containing, say 1000 lbs. of material, he does not stand close to it and push with bent arms and arched spine. He stands at arms'-length, rest his hands against some part of the case, keeps his arms straight and his back flat, and does all pushing with his legs, as in Fig. 9. In that position he is able to employ the full strength of his back. About the best exercise for strengthening the back and legs, and for teaching them to work together, is the one shown in Figs. 12 and 13. It takes considerable practice to master I; but it is worth all the trouble, because it is one of the fundamentals of super-strength. You stand with the feet about 16 inches apart and strongly braced, and then take a kettle-bell and swing it backwards between the legs, as in Fig. 12. As the kettle-bell goes backwards you bend your legs slightly at the knees, and lean the body forward from the hips; but you must not arch the spine. (In Fig. 12 you will see that the back of the athlete is almost as flat as a board.) From this position you swing the bell forward; and, as you do so, you bring the body to an upright position. This will make the kettle-bell swing at arms'-length straight in front of you and at about the heighth of your chest, as in Fig. 13. At that exact second you must release the kettle-bell with the right hand, grasp it with the left, and swing it back again. After reach swing you must change hands and, as you bend over, you rest the free hand on the knee. This exercise has so many beneficial effects that it should be included in the training of everyone who aspires to super strength. If you keep your back flat there is not the least danger of hurting yourself. Since your whole attention is concentrated on the swinging of the kettle-bell it is impossible for you to see whether you are doing it correctly; and so you should have a friend watch you and tell you whether you are keeping your back flat. Do not be so anxious to keep the back flat that you go to the other extreme and make the back hollow. The whole idea is to keep the spine as straight as possible and to do all the bending with the hips and knees. 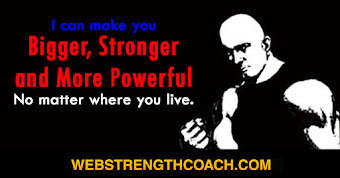 Here are a few of the things you will gain from this exercise: You will learn to instinctively keep your back flat when making a great exertion; you will get a much firmer grip on the ground with your feet; you will learn how to "time" a heavy moving object; you will increase the gripping power of the hands and increase the development of the front part of the shoulder muscles; you will become able to jump further and higher. It is because "Strong Men" practice such exercises as this, that they are able to make such remarkable records in the standing broad-jump and standing high-jump. 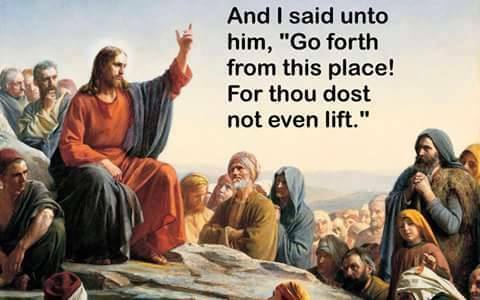 I know a lifter 40 years old and weighing 220 lbs. who can clear almost eleven feet in a standing broad-jump. At the age of twenty-five, when he was lifting professionally, he could jump even further than that; and, what is more, he could sprint 100 yards in 10 seconds flat. Incidentally, he holds one or two records in lifting heavy weights from the ground. 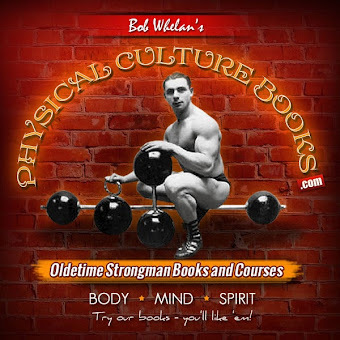 In the last chapter you will find some remarks concerning the influence which lower-back development has upon a man's vitality and virility.